MEMBERS ONLY: Come work on your business rather than in your business! 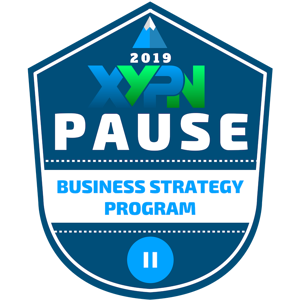 XYPN PAUSE is your opportunity to literally pause and work on your business at the strategic level. Our 2019 program includes a business strategy retreat at XYPN headquarters in Bozeman, Montana, but it's so much more. In addition to the 3-day retreat in May, participants will benefit from a comprehensive strategy program that begins virtually in March and concludes in July. Your trip to Bozeman will include some down time in the great outdoors in addition to some quality time with founders Alan Moore and Michael Kitces, who will update you on the Network's current priorities and welcome your feedback. For more information about how you'll spend your time in Montana, please check out the XYPN PAUSE: Business Strategy Retreat schedule. To qualify for this program, you must be a current XYPN member who is either on track to earn $125,000 of recurring revenue projected over the next 12 months or who is serving at least 50 client households. Because this program kicks off in March, the deadline to register is March 1, 2019. There are just 30 available seats in the 2019 program, available on a first come, first served-basis to those who qualify. Registration for 2019 is now closed. We've got a room block at Element Bozeman, our favorite hotel for out-of-town guests because it's conveniently located right downtown near XYPN headquarters. Reserve your room for $169/night; contact Lindsey Foote, Sales Manager, at (406) 539-3831 or book online here. Save on lodging by sharing a room. To find a roommate, add your name to the room share list. On Tuesday, we'll enjoy dedicated networking time and lunch at MAP Brewing located across the water from Bozeman Beach. If the weather is nice, continue your conversations on the patio or take one of the trails to explore Bozeman Beach. Room Share: To find a roommate and share expenses, add your name to the room share list. Laura Black is Professor of Management at Montana State University's Jake Jabs College of Business and Entrepreneurship. She has taught professional communications, business software skills, strategy, and entrepreneurship courses. She is also co-founder of Human Scale Business, which creates customized visual simulation models for entrepreneurial businesses, and a principal in Greer Black Company, a research and consulting firm specializing in collaborative processes. With work experiences in travel journalism and large-company information systems, she received her MBA from the University of Texas at Austin and her Ph.D. from MIT’s Sloan School of Management. Don Greer has worked with companies in semiconductor, logistics, aerospace, telecommunications, software, pharmaceutical, and commodity manufacturing industries as well as humanitarian and wildlife non-profits, cities, military, and large government organizations, and start-up ventures to help leadership and management teams create and implement effective strategies in complex environments. With 35 years’ experience as an internal and external consultant, manager, facilitator, and system developer, his work draws on rich theoretical frameworks and a repertoire of practical analytical, project management, and collaboration skills and tools. He is a principal of Greer Black Company, a research and consulting company specializing in collaborative processes for strategy design, operational implementation, product development, and organizational change and transformation.